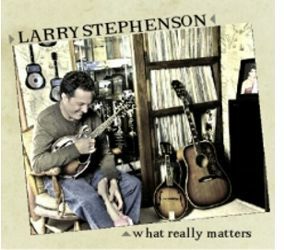 Highly regarded as one of bluegrass music's finest high lead and tenor vocalists, Larry Stephenson has been a torchbearer for the traditional sound for over twenty years and now, for his first album with Compass Records, Stephenson presents What Really Matters, available May 29th. The album is a fitting follow-up to the Larry Stephenson Band's win at the 2010 International Bluegrass Music Awards, his bluegrass star-studded previous effort, 20th Anniversary that took the prize for Recorded Event of the Year. On this new release, armed with 12 outstanding tracks and surrounded by a road-tested band that includes Kenny Ingram (banjo), Kevin Richardson (guitar) and Danny Stewart (bass), Stephenson's distinctive vocals are showcased to great effect, setting a distinct standard of clarity, melody and insightful storytelling. The overall album represents a personal reflection for Larry and the songs feature his grounded perspective as well as his musical maturity. "The song fits my life to a tee, my wife Dreama and I have a three year old daughter so now I see 'what really matters,'" shares Stephenson regarding the title track, a new song written by the late Harley Allen and John Wiggins. The rest of the album spans plenty of the familiar bluegrass themes that "really matter:" love lost ("The Blues Don't Care"), love found ("I See Love"), riding on trains ("Big Train") and the quintessential uplifting spirituals ("God Will," "Jericho Road") as well as a lively classic instrumental ("Bear Tracks"). At the suggestion of producer Ben Surratt, Stephenson called upon Sam Bush to record fiddle and harmony vocals their version of "Philadelphia Lawyer." "I've always been a fan of Sam's, love his mandolin playing and singing. Every time I see him he's so complimentary to my music and me. When I called him and told him about 'Philadelphia Lawyer,' he said, 'Ill have to get my Red Allen record out.' I knew I had the right man for the job! That I know of, it has never been done as a duet." Longtime producer and friend Surratt was again enlisted for What Really Matters. "Ben's the best! This is our 8th album together and he's co-produced four with me. He always comes up with great songs and arrangements and he makes the whole process enjoyable." This veteran performer continues to deliver new and fresh material while never straying far from his deep traditional roots. Inducted into the Virginia Country Music Hall of Fame in 1996, Stephenson is considered by many to be one of the premiere torchbearers for the traditional bluegrass sound created by first generation legends Jimmy Martin, Mac Wiseman, Jim & Jesse and The Osborne Brothers. Throughout his now over twenty-year career fronting his own band, and almost forty years as a major, touring performer, Larry Stephenson has been well-recognized and awarded by fans and his peers in the recording industry. He's been named Male Vocalist of the Year at SPBGMA (The Society for the Preservation of Bluegrass Music in America) five times. See Larry Stephenson's tour dates here.